Will Student Loan Debt be the Next Bubble? | The Law Office of Emil Fleysher, P.A. Will Student Loan Debt be the Next Bubble? | The Law Office of Emil Fleysher, P.A. Home Blog Bankruptcy Will Student Loan Debt be the Next Bubble? As the number of students unable to pay their student loans skyrockets, fear grows of a mortgage-style debt threat to the U.S. economy. With student loan debt now topping U.S. credit card debt and few or no options available for distressed borrowers, America faces the very real possibility of another major economic threat on a par with the devastating home mortgage crisis. As bankruptcy attorneys, we have seen an increase in the last three-four years of potential bankruptcy clients with student loan debt. 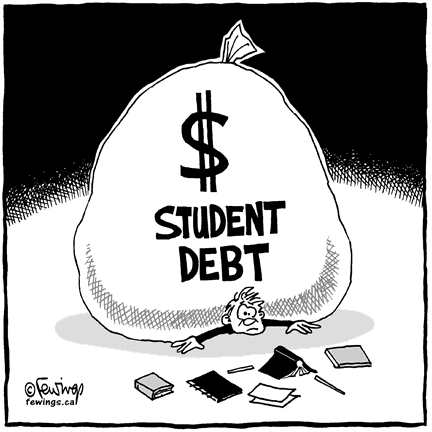 Further, few student loan debtors are seen as having any chance of obtaining a discharge as a result of undue hardship. College seniors who graduated with student loans in 2010 owed an average five percent more from graduates from the previous year. Borrowing has grown far more quickly for those in the 35-49 age group, with school debt burden increasing by 47 percent. Loans to parents for college education of children has also grown, seeing an increase of 75 percent since the 2005-2006 academic year. With the limited availability of student loan discharge, there is a big problem barring a fresh start for clients. Student loan debt collections have also become more aggressive in the last 18 months and debts more than 15 years old are still being pursued. Unless the bankruptcy code is changed to allow student loan discharge, bankruptcy attorneys will continue to be able to offer little help for these struggling borrowers.